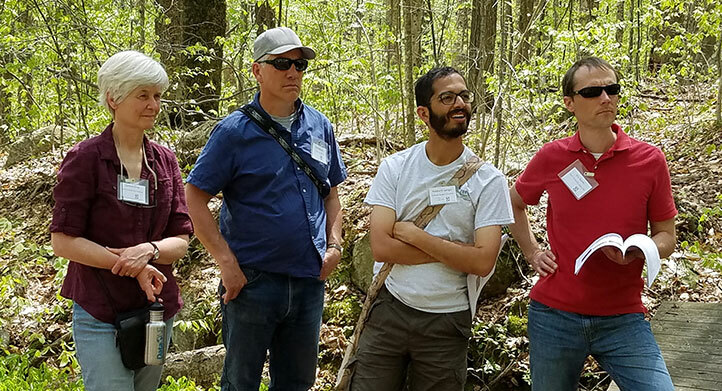 Research within the LTER Network is place-based, grounded in the deep knowledge that LTER scientists accrue from investigating the same ecosystems for decades. At each site, a core group of scientists identifies the major ecological or social-ecological questions that demand long-term study and plans a program of research for each six-year renewal. an outreach effort intended to inform and engage stakeholders in the research conducted at the site. Those basic elements form the nucleus on which a much broader research program grows. At each site, dozens of scientists from diverse disciplines capitalize on the historical and geographic context offered by an LTER project. They propose independent studies that depend on LTER data and experiments. The concentration of knowledge and creativity attracts graduate students and postdoctoral fellows who want to refine their craft in such a collaborative environment. At many sites, a university, non-governmental organization, or other federal agency maintains the physical site, while the National Science Foundation funds the majority of the research program, allowing each partner to accomplish much more than they could alone. The LTER Network receives its greatest funding from NSF, but other Federal agencies such as the USDA Forest Service and Agricultural Research Services, the National Aeronautics and Space Administration, the US Geological Survey, the US Environmental Protection Agency, and the US Department of the Interior’s National Park Service and Fish and Wildlife Service also support various projects at site and network levels. Funding is provided by NSF in the form of renewable six-year grants, which are independently peer-reviewed and renewed based on the quality of the proposed science. NSF conducts rigorous reviews of sites at the midpoint of each grant cycle, as well as a comprehensive review of the entire Network every 10 years. Although NSF funds each LTER project independently, the Network is structured to encourage cross-site comparisons, syntheses, and shared learning. Until 2015, an NSF-funded LTER Network Office facilitated both Network coordination and data archiving. In 2015, the Environmental Data Initiative was launched to bring LTER-style data management and archiving to a wider community of ecologists and a new Network Communications Office began managing synthesis working groups and other Network communication and coordination. The LTER Network maintains a strong tradition of self-governance through three Network-wide standing committees and a series of smaller appointed committees and project teams. The Principal Investigator from each LTER site serves on the Science Council, which provides scientific direction and vision to the LTER Network. Representatives from the Information Management and Education Committees, as well as the Executive Directors of the Network Communications Office and the Environmental Data Initiative hold non-voting posts on the Science Council. A rotating Executive Board carries on the day-to-day business of the Network. Each PI serves a 3-year rotation on the Executive Board, which meets monthly and is empowered to act on behalf of the Science Council. The Chair of the Science Council oversees the activities of the Executive Board and serves as — or appoints liaisons to — NSF, other agencies, associations, networks, the public, and to Network committees. The Information Management Committee (IMC) is made up of an Information Manager from each LTER site and elects their own executive committee, which sets agendas and represents IMC interests to the Executive Board, the Network Communications Office, and the Environmental Data Initiative. Each site has an Education and Outreach Representative who participates on the Education and Outreach Committee (EOC). Often, this individual leads a site’s Schoolyard LTER program. The EOC catalyzes and coordinates Network-wide education efforts, such as the Education Digital Library, Network-wide recruiting for undergraduate research opportunities, citizen science projects, and data literacy efforts at the K-12 and undergraduate levels. The chance to observe other LTER sites first-hand is a highlight of the annual LTER Science Council Meeting. The LTER Publications Committee reviews volumes proposed for inclusion in the US LTER Science and Synthesis Series. The U.S. ILTER Committee works to facilitate communication between the U.S. LTER and the International LTER network. The Diversity Committee works to develop resources and best practices for encouraging human diversity within the LTER Network. The Communications Committee works to improve communication both within the LTER community and with external groups. Its activities are guided by the communication portion of the Network’s Strategic Implementation Plan (SIP) and the more expanded Network Strategic Communication Plan. The Graduate Student Committee was established to foster interaction among graduate students working at LTER sites and between students and senior LTER scientists, to create student opportunities for intersite research, and to develop interdisciplinary graduate student training programs.